Procedures, and the reasons for performing them, are the core of establishing medical necessity. While coders are responsible for reporting procedures with the correct codes, they must coordinate with billers and physicians to ensure documentation includes the proper diagnoses to meet payers’ medical necessity requirements. Reporting a code for a procedure that is not deemed medically necessary by payers, including CMS and third-party companies, means that code will not be paid—even if the physician believes the procedure was clinically necessary. 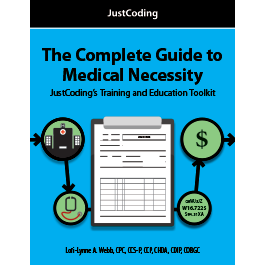 The Complete Guide to Medical Necessity: JustCoding’s Training and Education Toolkit, by Lori-Lynne A. Webb, CPC, CCS-P, CCP, CHDA, CDIP, COBGC, combines a book-length PDF, a full-length webinar, and other essential tools and downloadable information to provide coders with the training they need on properly coding while staying compliant with medical necessity requirements. This combined resource accommodates all styles of learning and provides valuable tools to help ensure ongoing compliance, such as sample forms and queries. Coders and billers from all settings—physician practice employees, outpatient and inpatient hospital staff, and others—will find this comprehensive resource to be invaluable as they seek to master coding concepts related to medical necessity and report compliant codes for the services their facility’s physicians provide. Lori-Lynne A. Webb, CPC, CCS-P, CCP, CHDA, CDIP, COBGC, AHIMA-approved ICD-10-CM/PCS trainer, is a compliance expert, data charge entry analyst, and HIPAA privacy specialist. Over the last 25 years, she has conducted prepayment, postpayment, and audit charge services for medical providers and insurance payers. She has worked closely with contracted third-party insurance payers for successful reimbursement outcomes. She has experience with inpatient and outpatient coding for physician- and hospital-based providers and facilities, in addition to supervising coding and clinical staff. Webb contributes education-based articles, webinars, and updates for national coding publications, including JustCoding. She runs Lori-Lynne’s Coding Coach Blog and is the coding resource for obgynhospitalist.com. She has presented at national AHIMA and AAPC conferences, IdHIMA (state of Idaho) conferences, and local AAPC chapters. She is an AHIMA ACE mentor and teaches CPT, ICD-10, and HCPCS coding. Webb’s specialty is women’s services, which includes maternal fetal medicine, OB/GYN office and facility coding, OB/GYN hospitalist labor/trauma services, and OB/GYN oncology, urology, and general surgical coding. PRIOR TO DOWNLOADING YOUR PURCHASED EBOOK – CLICK HERE TO INSTALL E-BOOK PLAYER FROM ADOBE. Click FILE IN MY DOWNLOADS AREA in the store, following your purchase. Then you can "link in" with your order confirmation/email, or when you login to your store account. SIGN IN WITH YOUR ADOBE ID. You can use your existing ID or create a new one. Save the login for future use. Your eBook purchase will appear in the Adobe Reader/player now — and anytime you want to access — just open the ADOBE DIGITAL EDITIONS APP.